As I’m still working a full time job, I don't have too much time on my hands. This is why whenever there’s a long weekend, I try to do what I love most: exploring nature with good friends. Being from Belgium, the biggest challenge for me is to find a good place to drive to. It can’t be too far, it has to have great views, the weather can’t be too bad,… So this time we decided to go to an area I’ve only ever visited in winter: the German and Austrian Alps. So I made a route, filled up the car with 3 friends who were as eager as I was to head out for a few days and we were on the road! This time I was lucky enough to get the opportunity to collaborate with Audi Belgium and explore the Alps with a brand new Audi Q5. What a comfortable ride! It had enough horse power for the German Autobahn, enough space to sit 4 people and their gear and also 4 wheel drive to get us though the mountains. Our first stop was Berchtesgaden, lake Konigssee to be more specific. From here we took the boat to Obersee and spent the day hiking in that area. The conditions for photos weren’t the best, as it was very sunny, but we still made the most out of it. We decided to stay in the Berchtesgaden area and hiked up to a viewpoint over Konigssee the next morning. At first, the view on the lake was completely blocked by dense mist. If it was up to me, we would've hiked straight down again. Luckily the other guys decided we should hang on for a while and hope that the mist would clear. After an hour or 2, it actually did clear up and we were rewarded with stunning views over Germany’s most beautiful lake. In the evening, we drove off to Austria to find a place where we would be able to set up camp for the night. After finding a pretty promising spot, we made dinner and enjoyed some beers together. These are the moments I personally enjoy the most. It got a bit bright in our tents pretty early, so i woke up to find a beautiful, fog covered, valley. Perfect conditions for photos! We roamed the area a bit more, making stops in Hallstatt and just enjoying the views in general. We spent the night back in Germany and enjoyed a morning stroll around lake Eibsee before our Audi took us back to Belgium. And back to Belgium with our Q5! A few weeks ago, travel agency TUI offered me to go on a short trip to Thailand. Since i’ve never been to any country in South-East Asia before, it was an offer i obviously couldn't refuse. A few days later, i was sitting comfortably on a plane, destination: Thailand, the land of smiles. After a pretty long and exhausting flight (i just couldn't get any sleep) my travel buddy Derek and I arrived at our destination, Phuket airport. From here, we would take a taxi to our hotel which was in Khao Lak, about an hour drive up north. I’m usually the kind of guy to be traveling with a tent, or sleeping in a cheap AirBnb, so arriving at Robinson Club (= our hotel) was kind of an exciting experience. After passing a big and secured gate, we drove next to various sports courts up to a big fountain in front of the hotel lobby, where we received a very warm welcome. A golf cart (i’m not kidding) took us and our luggage straight to our rooms. Well, rooms wouldn't be the correct word. My ‘room’ felt more like a small villa, it even came with my own private swimming pool. Can’t get any better than that i guess. Anyway Khao Lak would be our homebase for the next couple of days and from there, the plan was to explore the surroundings and see what Thailand had to offer. One of the first things that comes to mind when you think of visiting Thailand, is riding on the back of elephants. But sadly this is a cruel experience for the animals themselves, where they're even being tortured just so that they behave ‘correctly’ when there are tourists around. TUI, who organized my whole trip, is investing heavily in an organization which frees captured elephants out of this tourist trap, to let them spend the last days of their lives in a place where they can live peacefully. People can still visit them, feed them and even bathe with them here. Knowing that these majestic animals are being treated well, makes the whole experience of being close with them so much better. So if you ever visit Thailand for yourself, i definitely recommend you to go and see elephants, but only at a place where they're treated with respect. If you want to read more about the TUI care foundation, you can do so by clicking on this link. When visiting a country, i often try to see some less know/historical places just to understand more of the culture of the area. We did so as well in Khao Lak, visiting the small town of Takua Pa, which used to be famous for it’s mining activities, and was home for many people who’d work here. In the evening, we had a ‘sunset dinner cruise’, which translates into going out on the ocean, on a boat, during sunset and eat (good) food. While dinner was being prepared, I couldn't resist jumping from the deck of the boat in to the sea to enjoy a swim in the warm Thai waters. Once the sun had set, we had a lovely meal and headed back to main land. Day four was already our last day (i told you it was a short trip, right?) but i wanted to make the most of it before catching my flight back to Belgium. So Derek and I decided to head out to the Phang Nga national park to make a quick stop at Koh Panyee, a small fishing village located in the middle of a river. We left our hotel very early in the morning, so we’d bere there in time for sunrise. We were the first ‘tourists’ to arrive at Koh Panyee so we decided to make a small stroll around the village since we had some time left. Watching the town wake up, fishermen getting ready for a day of work, locals preparing everything for a market, kids already running around on the local football court,… such a cool experience. We snapped some photos and headed back towards our hotel, where our transport to the airport was already waiting. During our flight back, i realized one thing: no matter when and how, i’ll make it back to Thailand to really explore this beautiful country for a few weeks. Thanks a lot to TUI for giving me a first taste of South-East Asia, and hopefully see you soon. Sidenote: here’s a video my travel companion Derek (see more of his awesome work here) made of our visit to Thailand, enjoy! A few weeks ago my good friend Johannes asked me if I had time to go on a small trip with him and a friend. Obviously I couldn’t say no to this offer. Deciding on a destination we both wanted to go to was pretty easy: Faroe islands, a small archipelago in the Atlantic ocean. A place where the weather is unpredictable, where life is simple and people are kind. But also a place I’ve been dying to visit again since first experiencing its beauty almost 2 years ago. And so it happened, we booked some last minute flights, arranged a place to sleep, hired a rental car, packed our gear and were ready for some exploring. We (sadly) only had time to go for 5 days, including 2 travel days, which meant that we’d be spending just 3 whole days on the islands. Having such a short time, we made sure to plan our activities perfectly ahead to make every minute count. After a 7 hour trip from Dusseldorf over Copenhagen to Faroe Islands, we landed on a small airport on the island of Vàgar. Having only a few hours of daylight left, we rushed to the only place that was close enough to see: Gàsadalur and the Mulafoss waterfall. Gàsadalur is a small town with only 14 inhabitants and the Mulafoss waterfall is one of 8 European waterfalls to directly drop into the ocean. I’ve visited this place on my last trip as well, but the conditions were a lot better this time. A nice soft light made the town and the mountains glow up, while huge waves came crashing into the high cliffs. It was the perfect location to spend the last 2 hours before nightfall, shooting tons of photos and even risking our drones to get the right shot (something we ended up doing more than once during this trip). When it got dark, we drove off to our AirBnb, which was located in Sandavàgur. We chose this location as it was pretty central to the all the spots we wanted to visit during the next 3 days. There aren’t too many hotels on the Faroe Islands, so i’d personally recommend renting a place with AirBnb, as spending some time in a typical Faroese house only strengthens the feeling that you’ve made it to a pretty unique destination. We were lucky to have a great host who already put some cold beers in the fridge for us (and later brought us some more beers and a few bottles of wine, but that’s a whole other story). The good thing about visiting any Nordic country during winter is that you don’t have to get up too early to see the sun rise. We decided on watching the first light of day hit Trollkonufingur, which translates into “the Witch’s finger” (one of the many legendary places on the islands). After this, we headed to the airport as we had a short helicopter flight planned. We flew from Vàgar to Mykines and back. Seeing the stunning views from up high quickly answered my question about why there are so many birds to be found here: simply because the islands look even more stunning from the sky. We already did quite a lot this day, but we decided to hike to a place which both Jo and I wanted to visit 2 years ago: Drangarnir. A mythical rock standing proud in the ocean. A long hike (about 2.5 hours) starting in Sorvàgur, brings you to this incredible place. I’d seen plenty of photos but you can only capture the magic of some places when you see them in person. This sure was one of them. We spent a few hours being captivated by the view and it was already dark when we decided to hike back. Don’t forget your headlights if you ever plan to visit Drangarnir yourself! Today it was moody and (incredibly) rainy: classic weather on the Faroe islands. Our friend and local guide Kirstin joined us while visiting the island of Kalsoy, which can be reached by taking the ferry from Klaksvik. The island itself consists of one road, 4 very small villages and has a total of 147 inhabitants. I often wonder if these people know what it’s like being stuck in a traffic jam, i guess not. Due to the pouring rain, we didn’t get to see all the places we wanted to, but we did spend a lot of time wandering around in the streets of Mikladalur, which is one of the four towns. With cozy houses, a waterfall and a stunning view on the fjord, it’s definitely worth making a stop here. During the day it cleared up a little bit, allowing us to hike the mountain near Trollanes. It didn’t seem much of a hike at first, but eventually it did take us a good 90 minutes to make it to the top, having to catch our breaths more than once. Clouds were blocking any sunlight but the view was still pretty amazing. The way down was a lot easier as we just sat on the wet grass and slid down the hill, having a lot of fun in the process. After yesterdays heavy rain, on day 4 we were rewarded with great weather: partly sunny, (very) windy and high waves. The perfect conditions to visit Sorvagsvatn, one of my favorite places in the islands. After a short 30 minutes walk we reached the viewpoint while the first rays of sun warmed up our faces. If you ever want to see a lake over an ocean, this surely is the place. Seeing the waves crash into the cliffs made me mumble the only words i could think of: “holy moly”. For some reason this seemed to be the only right thing to say, as this place is just out of this world. I sat back and just enjoyed the views for most of the day, occasionally taking some photos. I did try to fly my drone, but it struggled too hard to not crash into the ocean hundreds of meters lower, so i quickly got it back to safety. 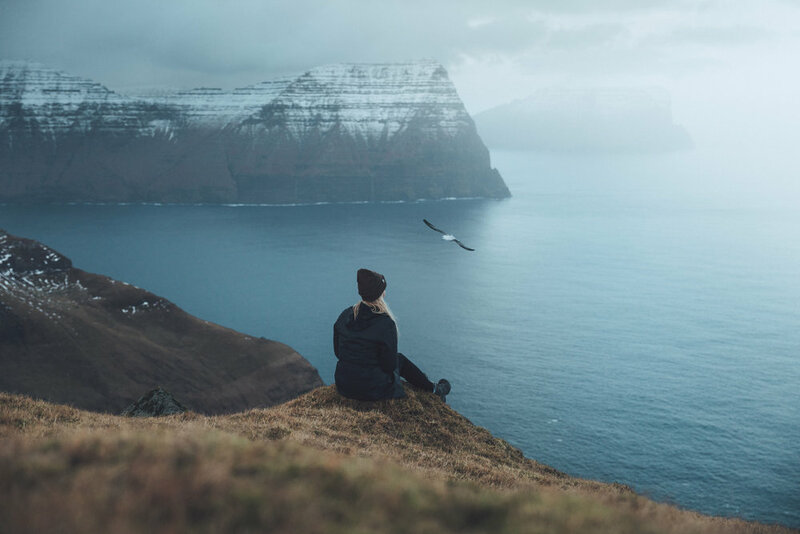 Faroe islands and using your drone isn’t the best combination i guess. I wouldn't be the first one to crash it here. View on Sorvagsvatn, can you spot the person in blue? Today was about packing our bags and saying goodbyes. Looking back on a few great days on the Faroe islands. It’s definitely not the last time that i’m visiting this place and I hope sharing this story and showing some photos might convince you to go there one day as well. I promise you, you won’t regret it. But for now: “Vit síggjast seinni!” (see you later! ).